Since I joined the Motorsport Club of Ottawa in 1997, I have wanted work at the Canadian Grand Prix at Circuit Gilles Villeneuve in Montreal. In our club’s 50th Anniversary book, there were many photos of MCO members working at the pinnacle event of Canadian motorsports. This year, through my involvement with the IMSA Porsche GT3 Cup Challenge Canada, I have been able to work as a scrutineer and pit lane official during the 2013 Grand Prix du Canada weekend. The weekend began on Wednesday when I drove to Montreal to help with the setup of the IMSA tech area. This involves setting up the car lift and scale, then levelling both (very difficult in this case because the pavement was sloped) and setting up the awning. On Thursday we completed our technical inspections of all competitor vehicles and driver safety equipment. Friday was the first of the track sessions. This introduced me to the special procedures for the support series at Circuit Gilles Villeneuve. All the support series were paddocked north of the hairpin, at the far end of the island from the pits and starting grid. An hour before our session starts, we line up the cars on a false grid near the paddock, on the narrow road along the Olympic rowing basin. At 30 minutes before the session, we move the false grid further up the road to the next false grid area. This is right next to the track fence, so we could watch the other sessions, including one of the Formula-1 practice sessions. 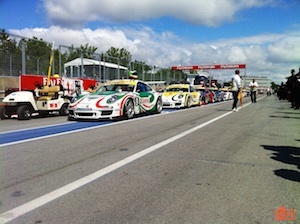 Pit lane for the Porsche GT3 Cup Challenge Canada, 2013 Canadian Grand Prix weekend. Finally, when the previous session ends, we are ready to move to the pit lane. Moving from the last false grid area to pit lane is only possible via the track, so it can only be once all the vehicles in the previous session are off the track. If the previous session was another support series, they are moved out of pit lane and drive counter-race back to a different track exit near the first false grid area, at the same time as our series moves up into pit lane. As it is a long distance, no one can even walk to or from pit lane – they must be on golf cart or pit bike. There is no way to enter the pit lane without a Formula-1 paddock pass, and we were not issued with those valuable passes. In pit lane, we had to stay on the right hand side, away from the Formula-1 garages. There was a row of pit lane marshals down the centre of pit lane keeping us away from the garages. All the pit equipment for the Porsche teams was pushed up against the outer pit lane wall. But just being at the circuit and being in pit lane during the Formula-1 weekend was so amazing. I have wanted to be part of the weekend for so long. Our final race was the last event before the Formula-1 race on Sunday. This meant we were told we had a hard cut-off time. Unfortunately the previous session had caused damage to the track guardrails, which delayed our start. The Clerk of the Course (Support Series), Cindy Armstrong, was able to get the Porsche GT3 Cup series most of our track time by pushing out the session end time. 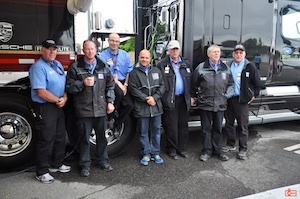 The IMSA team, 2013 Canadian Grand Prix. After the final post-race technical inspection on Sunday, we started the teardown of the IMSA equipment and trailers. We got everything down and most equipment packed away when we walked over to the hairpin to watch the first few laps of the Formula-1 race. We left the island after that, while the race was still on; if we had not left then we would be forced to stay for 2 hours after the race before they allow cars on the exit bridges. This weekend was a dream from me, to be part of a Formula-1 weekend. Tonight I did something potentially stupid, but it was awesome. I put my things in my car and looked around. I looked through the woods and saw the nearby Indian restaurant. I thought, would the restaurant have a pet goat? Or maybe it was tomorrow’s lunch. I listened into the wind. I thought maybe I’m hearing something else further away, partially muffled by the wind. Like children playing in the distance. Nope, that was close. It was coming from the woods. I could hear rustling in the trees. At first it sounded like something stepping very cautiously and carefully. There was more rustling and suddenly two shapes burst out of the woods into the grass field in front of me. It was a coyote and a deer running straight towards me. Then I did something potentially stupid. I stepped closer to get a better look at the coyote. 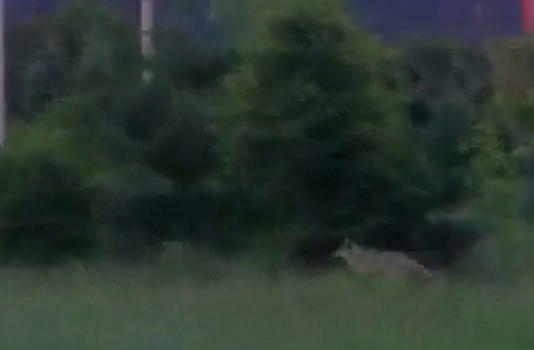 At first I thought the coyote was chasing the deer. Then I realised, no, it was the deer chasing the coyote. A moment later I could see a baby deer running across March Road towards the Alcatel-Lucent building. It barely made it across the road safely. The mother deer had been protecting the doe. It was the doe I had been hearing. The chase looped through the grass right in front of me three more times before the coyote finally left, defeated by the determined doe. I managed to get a few seconds of the chase on my iPhone but only remembered later that I had a Canon DSLR and 70-200mm f/2.8 lens in the trunk of my car, just metres away. I spent this past weekend helping move my mom from St. Thomas, Ontario back to Halifax, Nova Scotia. The major task was to drive her car down; she had hired a moving company to move the rest of her belongings. We agreed that the easiest way to do this was for her to drive to Ottawa, then we would continue together to finish the trip. She made it through the traffic on Highway 401 in Toronto to arrive in Ottawa Friday afternoon. We left early Saturday morning. I did most of the driving to Nova Scotia, but she took over for a few hours through New Brunswick. It gave us an second opportunity to talk. Although we have always tried to be close, we did not always understand each other. So these opportunities for uninterrupted discussions have really helped. Now, I better understand how to show her that I appreciate who she is as a person and as my mother. Once we arrived in Dartmouth, we checked into the Ramada. My sister Michelle had made reservations of us and her family for the night. On Sunday, we had the day to spend together with nearly all of the family. Only my sister Sue and my nephew Liam were absent (my parents are divorced – sort of). It was the first time in years I met Michelle, Portia, Burke, and Ali, and the first time in a decade to see Kayli. I was so happy to see them all again. I especially enjoyed the long talk I had with Ali and her fiancé Sean. Very early Monday morning, my mom dropped me off at the airport for my flight back to Ottawa. The visit was short, especially after such a long driving day on Saturday, but I was so glad to spend time with everyone in Nova Scotia. 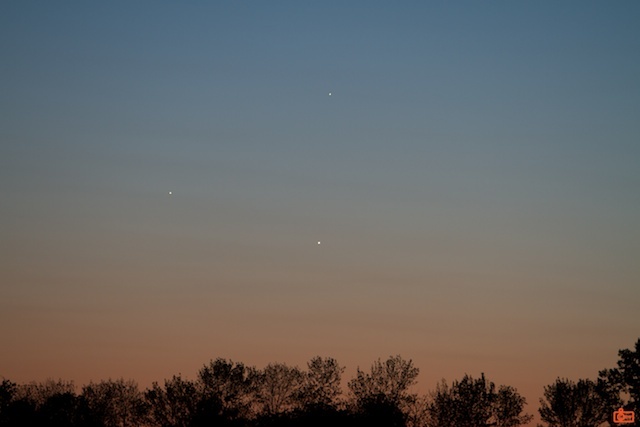 Venus at bottom, Mercury at the top, Jupiter on the left, Earth in the foreground. Four of the 7 visible planets in one shot. We won’t see a closer grouping until 2026. 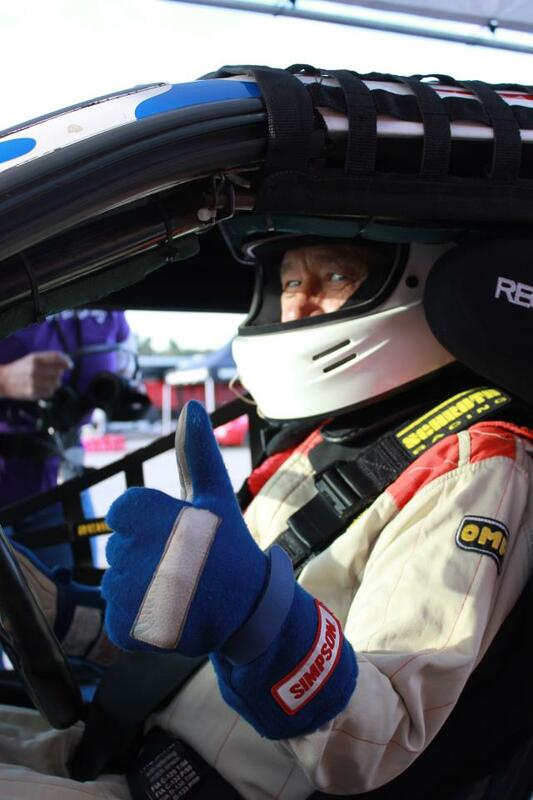 I am deeply saddened by the lost of long-time racer and instructor Bob Armstrong. I had been looking forward to seeing him at the CASC-OR Race School next weekend. Bob Armstrong in his office – the drivers seat of #33. He was a one-of-a-kind person. He was so generous with his time at the schools and for other racers. And his amazing race skills were second-to-none. I remember watching as a marshal at Shannonville one weekend as he pulled out an incredible lead on a GT Sprints field after only a single lap in the rain. I was told he held the Formula-1600 lap record at Mont Tremblant for a number of years. It was a privilege to be able to work with Bob and his wife Cindy for the Race School and Race weekends hosted by MCO. They were both at the top of motorsports; Bob was Chief Instructor for the race schools and Director of Track Safety for the Formula-1 race in Montreal, Cindy wrote most of the CASC-OR rule book and is a highly respected Clerk of the Course. I co-drove with Cindy in the Armstrong Motorsports #44 in 2005. My good friend Don and his fiancé Ke invited Rosa and me to their wedding in Las Vegas. Rosa was not able to go due to work commitments. I almost did not go either. Three days before my flight, I hurt my back with heavy lifting on the weekend and then bowling at the MCO general meeting. I was in a lot of pain. I was afraid I had a lower back hernia (not a herniated disc, but a muscle hernia). I was able to see a doctor who said it was only a muscle spasm, and prescribed some pain killers, anti-inflammatories and muscle relaxants. The muscles of the lower back are not prone to hernia injuries. I was feeling a bit better the next day so I went ahead with the trip. Upon arriving in Las Vegas, I checked-in to a Hilton south of the airport. I gathered up my camera equipment and left for Maverick Helicopter departure location, which was very close to the hotel. Rosa had previously visited Las Vegas before we met, and she pushed me to take the same helicopter tour of the Grand Canyon that she had taken. It took about 45 minutes to complete the check-in for everyone, and then we were assigned to the different helicopters. 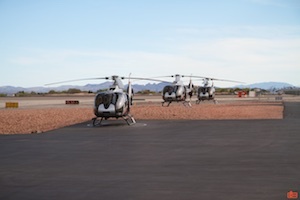 There were 7 helicopters that would be involved in the sunset tour. 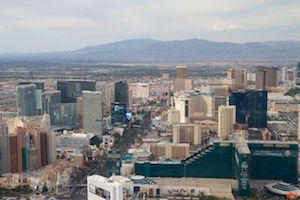 Part of the Las Vegas strip from a Maverick Helicopter tour. I made sure that I had a good seat for the flight. I was in the centre seat in front, with lots of glass available for taking pictures. However, in practice it was a little harder than I expected as the glass was curved like a bubble – good for viewing but the distortion limited the directions that allowed for good photos. With weight and space restrictions, I could not bring a camera bag, so I put my wide angle Canon EF-S 10-22mm in one coat pocket and my Canon 550EX flash in my other pocket. Once everyone was buckled in, the pilot started the engines and did the pre-flight check. Then something magical happened – we gently lifted off and hovered about 30cm above the ground. The feeling of hovering in one place and then slowly pivoting around to face the nearby McCarran International Airport was unlike anything I have ever experienced and was totally unexpected how much it would impact me. The freedom of movement, the graceful but intimate feeling of flight, so close to the earth and yet totally unconnected and free to move in any direction. It was a very special feeling for me. We skimmed down the airport apron performing the final flight checks before the pilot pulled up on the collector and we soared into the sky. The view was magnificent – the city of Las Vegas falling away and then falling behind, the tops of the hotels along the Strip catching the setting sun. We flew eastward, north of Lake Mead, up and down through the canyons along the top of what would become the Grand Canyon. The pilot did the expected heart-stopping manoeuvres up over the tops of the ridges and plummeting down the far side. I was having such a good time. The Grand Canyon is about 450km long, up to 29 km wide at the top, and 1,600 metres deep. Nearly two billion years of Earth’s geological history has been exposed by the Colorado River. The Grand Canyon, after the local sunset. We flew for about 20 minutes to a picnic site at the lower end of the Canyon that had been set up by Maverick for all the guests. They set out drinks, fresh veggies and dip, cheese and crackers. We talked in small groups – my fellow travellers came from all over world – and spent lots of time taking pictures of the surrounding scenery. The top of the Canyon was still catching the sunset and was aglow in pink and rose and orange and red. After 40 minutes at the picnic site, we all climbed back in the helicopters and flew out of the Canyon and along the eastern side were we rendezvoused for a refuelling stop. Then we took off for the final leg back to the airport. We flew past the Hoover Dam and then approached the Las Vegas at dusk. The skyline was brilliantly lit up, highlighted by the lights of the Strip. After touch down, I returned to the hotel exhausted. The next morning I woke up early due to the 2-hour timezone change. I had a long list of sites I wanted to see, so I checked-out, had a quick breakfast and started off. 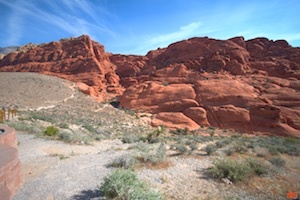 My first destination was Red Rock Canyon National Conservation Area, 24km west of downtown. I wanted to do it early in the morning before the heat of the day. There is a one-way 24km long loop road that winds through the area, with parking lots at the various trailheads along the route. I stopped at a few of them to take more pictures and to walk around. With the limited time and the fact that I did not have hiking shoes, I did not stay very long at any stop. The scenery was so beautiful; I want to come back and spend a few days hiking and taking pictures at sunrise and sunset. The loop road was also popular with bikers (both bicycles and motorcycles). I would love to drive the road at higher speeds like the Silver State Classic Challenge. That would be a blast. After completing the loop, I headed to the other side of Las Vegas for a tour of the Hoover Dam. The Hoover Dam is one of the iconic public works in the world, and a beautiful example of the Art Deco style (my favourite). It was built between 1931 and 1936 during the Great Depression. It is 221 metres tall and 379 metres long (curved). The top is only 14 metres deep, but at the base it is about 200 metres. It is this incredible weight that allows it to hold back the waters of the Lake Mead reservoir – the largest in the country. After I parked, I first walked out onto the Mike O’Callaghan–Pat Tillman Memorial Bridge, which forms a bypass from the old narrow road that went along the top of the dam. From the bridge, you have a great view of the face of the dam and the Colorado River 260 metres below; it is the second highest bridge in the U.S. 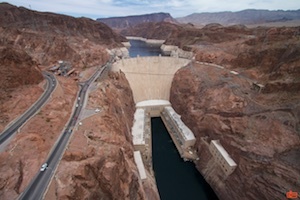 The Hoover Dam from the Mike O’Callaghan–Pat Tillman Memorial Bridge. Next, I took the tour of the interior of the dam. There are 17 turbines in the turbine room providing 2080 Gigawatts of power. The turbines are driven by the water pressure; the water reaches 140km/h when it is fed into the turbines. 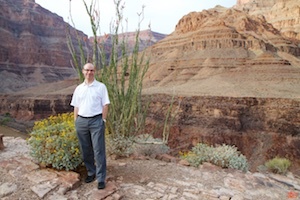 After the tour, I had lunch in the café and took a walk along the top of the dam and then returned to Las Vegas. 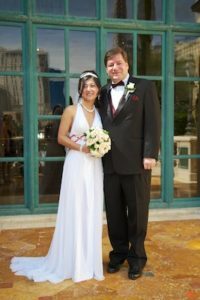 The wedding was to be held at the Bellagio luxury hotel. I checked-in in the early afternoon. This was another over-the-top experience. I was so excited to be there. The noise of the machines, the bustle of the crowd, the beautiful interior details. It had the right feel – it made me feel like a million bucks to be there. The elevators are on the other side of the gambling floor of course. There were so many people, and so much going on. I walked around the hotel, then went for a swim in the pool. I met Don and Ke and the rest of the wedding party in in their Penthouse Suite before dinner. Their room had an amazing view of the famous Fountains of Bellagio through the floor-to-ceiling windows. We had some drinks, some sweets then split into the bachelor and bachelorette parties. The bachelors (well, we were all in relationships/married) had dinner at Prime Steakhouse at the Bellagio. The meal was wonderful – I had a steak of course. Better than the meal was the conversations. Although I had never met any of the other guests, and I am a terrible introvert, I immediately felt relaxed with everyone. Dinner lasted about 2.5 hours. After dinner, we went to a low-end blackjack table. I had intended to gamble a set amount, but I didn’t bring all the cash with me. I also wasn’t focused on the math, so I eventually lost. I watched the others play and got the hang of it, but the limousine was waiting so I could not start up again. We had a VIP limo ride to the Spearmint Rhino Las Vegas, a gentleman’s club, and a reserved place and server girls dedicated to our party. The server at my end of the party (we were seated along a row) said she was originally from Budapest, but when I tried to ask more she demurred and didn’t give me any more details. The music was so loud it was hard to talk without extreme effort. We returned to Bellagio between 2 and 3AM. The famous Las Vegas sign, at the southern end of the strip. 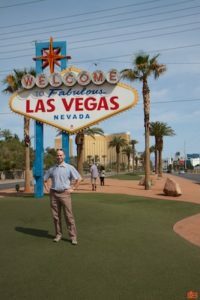 In the morning, I had a short time to take my picture at the famous “Welcome to Las Vegas” sign before returning to the hotel to get ready for the 11AM wedding. Don and Ke had a private balcony overlooking the Fountains of Bellagio. Ke was stunning in her wedding gown. After the ceremony, we watched a special fountain display created just for the wedding party. We had a few hours of free time between the ceremony and the wedding dinner. I decided I really wanted to celebrate with an ice cream at Café Gelato. I brought my MacBookPro so I could look through the photos I had taken. Over the next 2 hours, most of the rest of the wedding party stopped by and had gelato too. It was great. We were talking as if we had been life-long friends. It was the people I met that made this one of the most memorable trips I’ve taken. Don and Ke’s wedding at the Bellagio. For dinner, we had a private dining room. The food was elegant and delicious. The desert was interesting – a chocolate ball, topped with a sliver of gold leaf, that would dissolve after being covered in hot chocolate. The next morning I flew back home. Although I only had a short time in Las Vegas, the scenery, the novelty and the new friends made this one of the most memorable trips I’ve ever taken. In mid-January, I was asked to plan a 4-week stay in Jakarta for a project for a special customer. I would be assisted again by the Head of Sales and Ashish, a verification prime from India. As I had previous experience in Indonesia, and I was available for such a long deployment, I was given the opportunity. The project was to test a new feature with the customer that had requested it. Upon arrival, I checked-in to my home for the next month, the Hotel Kristal. At first I was checked into a room with two bedrooms, but it was on a smoking floor so I asked to be moved to a single room on a non-smoking floor. Each room has a small kitchen, so I was able to prepare my own meals and have cold drinks when I wish. The hotel was conveniently next to the Hero Supermarket, so keeping my kitchen stocked was not a problem. My first week in Jakarta was dedicated to planning for the upcoming testing, including the test plan and test site selection. We agreed with the customer to use the Museum Transportasi in Taman Mini Indonesia Indah (TMII). TMII is a huge culture-based recreational area in the Southeast part of Jakarta. It contains many museums, a huge lake with artificial islands in the shape of Indonesia, venues representing the cultures of all 33 Indonesian provinces, gardens, public buildings, religious sites, a cable car and wind-powered monorail (one of only three in the world), recreation facilities, an aviary and a reptile zoo. It was a fascinating location. The museum site was two-stories tall, with the long building overhangs connecting to form a sheltered walking area on the ground floor. We worked mostly on the ground floor, enjoying the open air but avoiding the hot sun and heavy rains. Richard with fans at Taman Mini Indonesia Indah. During our 2 weeks working at the site, I was a frequent point of attention for Indonesians visiting the museum. Often I was asked by school children and adults if they could take their picture with me. I was told by my Indonesian cohorts that I was often discussed by people walking by. I guess that many had not seen a Caucasian before, so I was the subject of much curiosity. I took it all in stride as I was just as fascinated by Indonesians as they were of me! Of my Indonesian cohorts, I grew very attached to them and made some deep friendships that I value greatly. We had the best talks about life, family, history, politics, and religion – some of my favourite topics. Many an evening we sat in a nearby café drinking chocolate milkshakes and having a smoke, talking for hours. The integration testing went well, any issues were found were addressed quickly by the design teams. Ashish was invaluable as he was the validation prime for the feature we were demonstrating. As I had only 2.5 months experience, his deep knowledge of our products were critical to the completion of the testing. I learned so much and I am glad that I was able to contribute. I had little time off during February, as we were working 7 days a week. When I was not at the test location, I was at the hotel writing reports and emails. Sometimes I could take a few hours to go to the malls. The nearest was Citos (Cilandak Town Square Mall), which had a great variety of restaurants and a fabulous bookstore called Aksara. The other mall was the massive Pondok Indah Mall (PIM) which also has a huge variety of foods and hundreds of stores. Monumen Nasional in Jakarta is 132 metres tall. It is the national monument for Indonesian independence. Only once did Ashish and I take time to visit a tourist site in Jakarta. 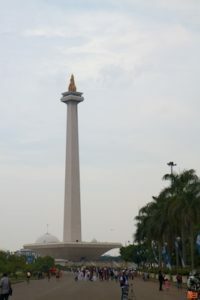 One Sunday morning we traveled to see the National Monument (also known as Monas). It is a 132-metre tall tower in Central Jakarta built to commemorate the struggle for Indonesian independence. In the base of the plinth is the Indonesian National History Museum, which uses dioramas to portray the long history of Indonesia from pre-history through the events of the past few decades. I wanted to continue to walk around the area to visit the huge Istiqlal Mosque, the largest in Southeast Asia, but we could see the rain clouds gathering so we grabbed a taxi back to the hotel. The downside to being in Jakarta for 6 weeks was how much I missed Rosa. 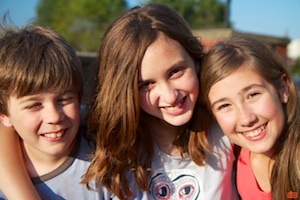 We spoke every few days using FaceTime and Skype, and wrote emails every day. The 12-hour time difference made realtime communications difficult. I also missed driving in the MCO Ice Race. I called my friend and co-driver Jay the next day, and he told me about the event. I so wish I had been there. Along with the friends I made in Jakarta, I also really enjoyed the opportunity to try so many local dishes. They would take me out to different restaurants that I would never have found by myself. Some were very spicy, but I was able to finish everything I sampled. As I approached the end of my stay, I was asked to extend my trip so that I could provide a training session for the customer. I agreed and extended my stay at the Hotel Kristal by another 2 weeks. Weekly fashion show at Citos (Town Square) mall. As the Visa-On-Arrival is only valid for 4 weeks, I had to go through the process of extending my visa. This involved a lot of research on the internet and two trips downtown to the Kantor Imigrasi office. I was nervous as I was going alone and was not confident that I would find enough people who spoke English. The process was very confusing, involving going to areas on three different floors in the building, but the tips I read on the Internet provided the guidance I needed. By this time Ashish had returned to India so I was by myself for the remaining time. Providing training was a real challenge, as I felt I was so new to the area. I prepared very hard and was able to provide a half-day training session for about 20 people. I think it was well received. After the training was completed and the trial results were accepted by the customer, I could book my return flight for the second week of March. I was faced will some big challenges, but I very pleased with the accomplishments and achievements for my 6 weeks in Jakarta. I hope I can travel back again in the future. I’ve been working at the Museum Transportasi at Taman Mini Indonesia Indah in Jakarta, Indonesia for the last week. Every day there are scores of people visiting the museum, and every day someone wants to take a picture with the strange looking Canadian. I visited St. Thomas this weekend. It was to be a visit with my mom, my youngest sister and one of my nieces. However my sister was called away to Nova Scotia at the last moment and my niece went with her. So I had an extended weekend to spend time with my mom and see part of southern Ontario. My mom had not traveled extensively around Southern Ontario, so this was a good opportunity for us to drive around sightseeing. Our first stop on Saturday was Stratford. This small town of 31,000 has been the site of the annual Stratford Shakespeare Festival since 1953. We stopped at the Festival Theatre, which echoes the circular shape of the original Globe Theatre. It seats 1,826 attendees and opened in 1957. As the theatre was not open, we could not see the inside, but photos online look very interesting. I should like to attend a performance in the future. The monumental red-brick City Hall was completed in 1899; it is now designated a national historic site of Canada. After lunch at Bentley’s Bar Inn (pulled-pork poutine), we continued to London. London is a good sized metro of just under 500,000 people. We saw the hospital where my sister sometimes works, the train station, stadium, and so forth. The highlight building for me was the wonderful Art Deco Dominion Public building, finished in 1936. That evening we went to see the new movie “Lincoln”. We both enjoyed the movie. The next day mom suggested we visit Port Stanley, which is a beach that she often goes to with my sister and niece. Although it was winter we still went to see frozen Lake Erie. I’m sure it’s a great place in the summer; in the winter the wind pushes the lake ice onto the shore. We drove along the shore of Lake Erie, where there were many wind farms. We ended up in Port Burwell. Port Burwell has a very unique attraction. 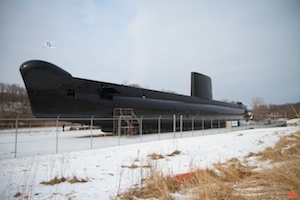 The Oberon-class submarine HMCS Ojibwa (S72) was brought ashore to become part of the planned Museum of Naval History. Seeing a Cold War submarine sitting on solid ground was mind bending. Although the trip was short, just three days, it gave us time to talk about life, the family, and the future. It is sometimes difficult to have really good discussions over the phone, which has been our main method of communicating. 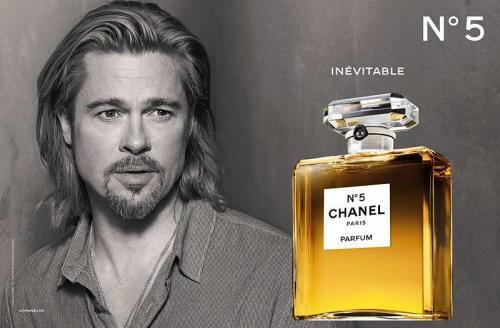 I have to say that the simple B&W photos of Brad Pitt in the new ad campaign Chanel No. 5 perfume are fantastic. In the Ministro Pistarini International Airport (Buenos Aires), there are huge posters of the ads down the length of the concourse. The photographer is Steven Klein. They are very well shot. This is apparently the first time a man to represent a female fragrance.